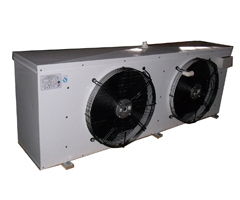 D series evaporator is the cooing equipment in the walk-in cooler matching the condensing units of freon refrigerant. 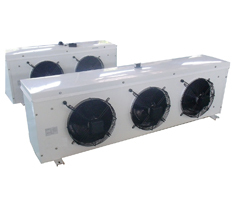 By the temperature it suits, it isdivided into 3 series: DL,DD,DJ for the different temperature required inside the coolers. 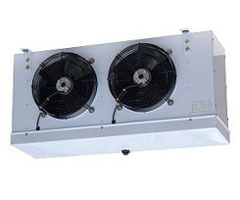 DL series evaporator is mainly used for the fresh-keeping coolers around 0℃ temperature requirement, DD series suited for -18℃ freezers, and DJ for -25℃ quick-freezers room. 2. The coil is crossed-arranged, using the mechanic method to expand the tube, which make the copper tube and the aluminum fin jointed closely,to achieve the good heat exchange effect. 3. The electric heating tube of good quality stainless steel is deployed evenly in the coil, having good defrosting method. 4. Using double layer water drain pan loop, which can prevent the ice freezing on it effectively. 5. The long distance air sleeve can be used by the customer requirement. 6. Specification is as the PDF file.